The results of the Perseid 2004 observing campaign are presented. Short description of equipment and reduction methods is given. Predicted 1-rev Perseid peak on August 12/13 was confirmed by video and visual observations, moreover another peak of activity was detected the same night around 1 UT. In total 87 meteoroid trajectories and orbits were calculated and resulting mean orbital elements of Perseid stream were presented. Polish Fireball Network (PFN) was founded in February 2004, few months before Perseid shower maximum described in this article. Initially it consisted of CCTV cameras which were used during Leonid 2002 campaign and some photographic devices with rotating shutters. During first half of the year these cameras were relocated to new fireball stations and then new fields of view, proper for double station work were calculated. In the middle of 2004 fireball stations in Ostrowik, Złotokłos, Poznań, Cracow and Nowy Dwór Mazowiecki were ready to work. According to predictions given by Lyttinen and Van Flandern (2004) and Vaubaillon (2004) we suspected an enormous Perseid activity was expected in 2004. Due to the close encounter with the one-revolution trail from 1862 a narrow, short lived peak was expected at August 11 2004 on 20:54 UT. Vaubaillon (2004) pointed that this peak will consist of a small particles mostly and might be observed by a radio equipment rather than by a video or photo technique. We decided to organize special astronomical camp in Ostrowik Observatory (40 km SE from Warsaw) during this maximum. Video fireball station in Telatyn (about 250 km SE from Warsaw) was temporarily created too. On August 10 2004 two photographic, six video fireball station and more than 10 visual observers were ready to work. Weather over Poland in the middle of August was rather good. One night before maximum we had an excellent visibility, reaching visual LM = +6.8 mag. in Ostrowik Observatory when the camp was held. This value was only slightly lower during next two nights. Whole video system worked continuously during three consecutive nights - 10/11, 11/12 and 12/13 08 2004. Video fireball stations were equipped with Tayama and Mintron CCTV cameras with 8 and 4 mm lenses. These cameras were able to detect +2.5 and +1.5 magnitude meteors respectively. Typical distance between video stations was 200-250 km (with exception of Ostrowik-Złotokłos base which is only 50 km long). Whole fireball network registered 364 meteors at August 10/11, 1209 meteor at August 11/12 and 402 meteors at August 12/13. First results coming from our visual observers confirmed strong and narrow peak around 20:55 UT. It was created mostly by a faint meteors, with r >= 2.5 and ZHR at least 200. Surprisingly, another wide peak was observed before sunrise with a presence of bright meteors which were easy to catch by video and even photographic systems. High Perseid activity was observed also in the evening of August 12 also (it probably came from annual maximum which occurred during daylight). These maximas were clearly visible in the preliminary IMO visual analysis also (Arlt, 2004). With almost two thousand meteors registered we had a chance to confirm it by video method. All video records were reduced by MetRec software (Molau, 1998). Taking coordinates from MetRec's DBF files, we created planes between every fireball station and meteor points observed by this station. Intersecting these planes using IMOgena software resulted in list of more than 300 double events. Reduction routines used by IMOgena software are described in details in the Proceeding of First EuroPlanet MOD Workshop 2006 (Żołądek et al., 2006). Every double event was calculated using IMOgena Planes and IMOgena Orbit and then data selection was applied. We rejected all events with plane intersection angle less than 10 degree, with radiant coordinates error greater than 5 degrees or with large geocentric velocity error. Some meteors required additional image reduction using AstroRecord 3.0 software (De Lignie, 1997). During reduction we found some differences between results obtained by 8 mm and 4 mm video systems. Plate reduction of the 8 mm was quite simple, images with good quality and without significant off the axis aberrations were easy to measure. However 4 mm lenses caused some trouble. We found that coordinate grid created from all stars visible on the image was not sufficient to obtain precision required for orbital calculations, even in the case of 3-rd or 5-th degree plate constant using. This local coordinate systems were created from stars closely surrounding each meteor on the image and that brought us to the best results. Every meteor has its own local coordinate system free of the image edge distortion influences. This method is off course more time demanding than traditional one. During images reduction we found that 8 mm system has much better precision and meteor limiting magnitude than 4 mm. It caused some differences in the mean parameters calculated by these systems. For example, mean trajectory beginning height calculated from 8 mm cameras was a bit higher due to better meteor limiting magnitude (meteors are detectable earlier and higher than on 4 mm systems). Statistical analysis of some parameters (in example beginning heights, trajectory lengths or photometric mass indexes) should be done separately for datasets coming from both camera systems. The PFN video system recorded 1975 video meteors during three consecutive nights. 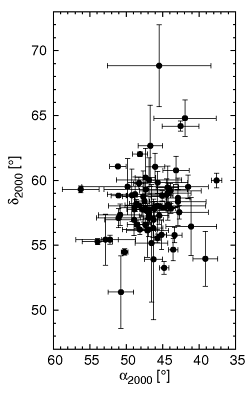 Meteor counts on 8 mm CCTV cameras clearly show strong, narrow maximum around 21 UT (see Fig. 1). Exact time determination for such narrow peak is not easy because we observed strong time grouping, typical for Perseid stream. In example our 8 mm camera in Ostrowik observed five Perseids during one minute on 20:43 UT and then not observed any meteor during next 3 minutes when the next similar group appeared (see Fig. 3). Another increase in the Perseid activity is visible during second half of the night. 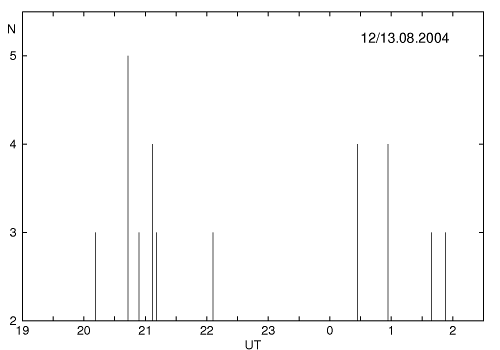 The second, slightly diffuse peak observed around 1 UT is rather wide and consists of brighter meteors than the first peak observed around 21 UT. Figure 3: Perseids occurrence time grouping in one minute periods observed on two 8 mm CCTV cameras (only groups larger than 2 meteors were shown). For double station events geocentric velocity distribution was created. It is shown on Figure 4. 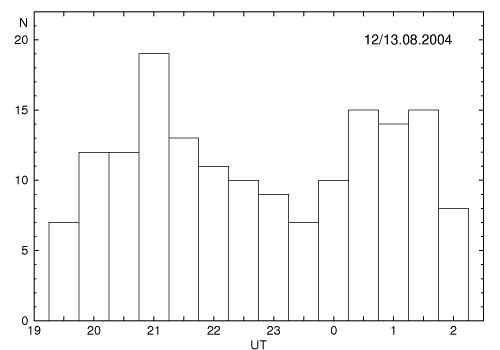 Vast majority of calculated events has velocities typical for Perseid stream with mean value 57.86 km/s ± 2.33 km/s. A trace of some Aquarid complex meteors can be also noticed. Mean Perseid radiant resulting from double station results was observed at a = 47.36 deg ± 3.22, d = 57.76 deg ± 2.31 deg. 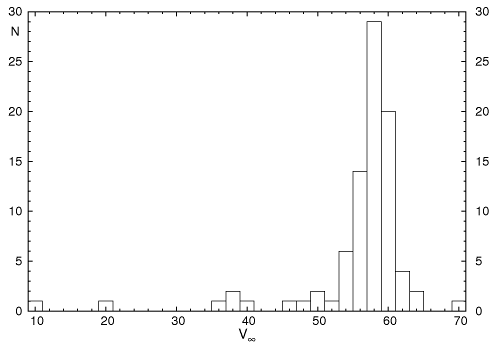 Individual radiants for all calculated events are presented in Fig. 5. Mean orbital elements calculated from all non-hyperbolic orbits are shown in Table 1. Table 1: Mean orbital elements for Perseid stream calculated from PFN video data. This short article describes the results of the first serious PFN observing campaign. It was a test for our camera system and for our IMOgena software. Results obtained for 2004 maximum looks quite good, however effective and error free coordinate grid calculations should be a matter of further investigation and software improvements. Our results clearly confirmed activity peak caused by 1-rev trail, however another peak was observed at August 12 around 1 UT. Trajectory parameters and orbital element were calculated for 87 individual double station results. These data will be reexamined again in the future when we improve our plate reduction methods. This work was supported by Siemens Building Technologies Polska and Polish Ministry of Sciences and Higher Education. K. Złoczewski is supported by scholarship from Foundation for Polish Science. We would like to thank all people involved in video data reduction and all people responsible for video equipment during 2004 Perseid maximum. Eds. : Mc Auliffe, J., Koschny, pp. 28-36.